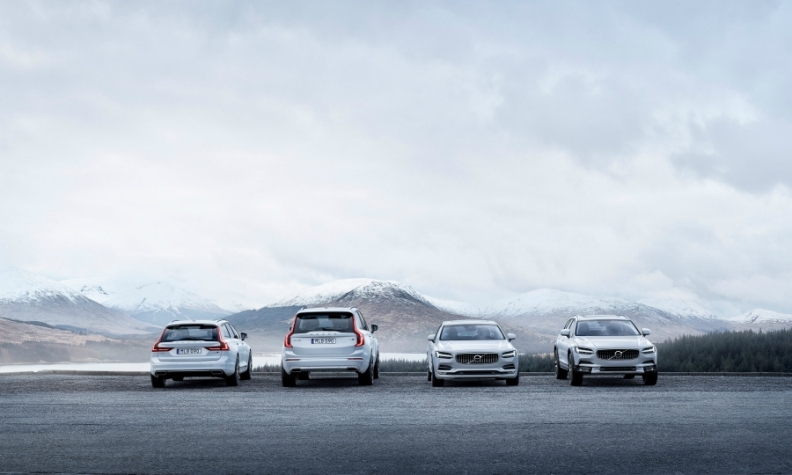 Volvo expects to set a sales record in 2017, its 90th year of car production, because of high demand for models such as (from left) the V90, XC90, S90 and V90 Cross Country. Anders Gustafsson sees Volvo's 90th birthday from the most unique perspective of anyone on the company's executive management team. The 48-year-old Swede's family has been selling the brand for the last 45 years through its company, Bildeve, which is the oldest Volvo Cars dealership in southern Sweden. Like Volvo, Bildeve turns 90 this year -- and both are thriving. "Volvo has tried so many times to reach the premium level and now it is there," Gustafsson, who is the automaker's senior vice president of Europe, Middle East and Africa, told Automotive News Europe. Since 2014 Volvo has annually set a new global sales record, a streak it expects to continue in 2017 by topping the current high of 534,332 that was reached last year. The company's 2016 operating profit rose 66 percent to 11 billion Swedish crowns ($1.24 billion) and revenue increased 10 percent to 180.7 billion crowns. That helped improve the automaker's profit margin to 6.1 percent compared with a 4 percent margin in 2015. In 2013, Volvo's operating margin was just 1.6 percent. The goals for 2020 are even tougher: global sales of 800,000 vehicles and a profit margin of 8 percent. Volvo's continued revival under Chinese owner Zhejiang Geely Holding, which bought the underachieving automaker from Ford Motor Co. in 2010, gives Gustafsson reason to believe that the best is still to come. "I am very confident we can stay at this level, but we're going to have to work even harder to try to exceed what we have already achieved," he said. When asked what Volvo's 90th birthday means to him, Gustafsson told ANE: "It's extremely personal. My whole life has been connected to Volvo." Gustafsson's first job was at the dealership, where he started cleaning cars at age 14. He is the youngest of four brothers. His oldest brother is stepping down this year as managing director of the dealership after 45 years at the company, which sells about 3,500 vehicles a year, and will be replaced by Gustafsson's second-oldest brother, who has worked at the dealership in Helsingborg, Sweden, for the last 30 years. Given his family's long history with the brand it only seems natural that he was handpicked by Volvo Cars Sweden to be groomed to take on a high-level position within the company. Gustafsson is one of many Swedes who feel a strong connection to the brand. Another is CEO Hakan Samuelsson, who didn't hesitate when he was asked in 2010 to join the company's board of directors. "I said 'Yeah, of course.' It is a Swedish crown jewel. If you could in any way play a role in improving that you would take it." He was given even more power to guide the company in 2012 when the board asked him to succeed Stefan Jacoby as CEO of the automaker. In the release to announce the change Samuelsson said: "My focus will be on execution and performance, to secure profitability and meet our sales objectives." That level of belief and determination was exhibited by Volvo founders Gustaf Larson and Assar Gabrielsson in the 1920s when they asked themselves whether Sweden could produce its own cars. On April 14, 1927, they proved it was possible, and the company is poised to make its next 90 years even more memorable.